In this paper I propose to reconsider theories of diegetic space that rely on explicit framing (i.e., "two people walk into a room" or "in Spain"). Rather than looking for maps, I define space in terms of lexical categories denoting objects. 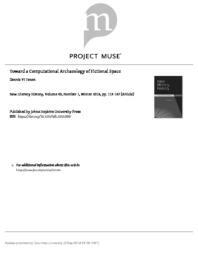 The emphasis on objects leads to a method for literary archaeology, informed by cognitive theory and anthropology. If the universe is made of atoms, a fictional world is also made up of atomic relationships that form basic, stable configurations, or what I call narratological primes. I construct several such basic spatial buildings blocks here—diegetic density and clutter distance. Their application to a well-explored body of nineteenth-century novels challenges several long-standing historical intuitions related to the development of material culture in the nineteenth century.